This bronze sculpture of the “Famous Five”—the five women whose challenge to the Supreme Court of Canada in 1929 resulted in women being legally recognized as persons under the British North America Act—was unveiled at a ceremony on 18 June 2010. 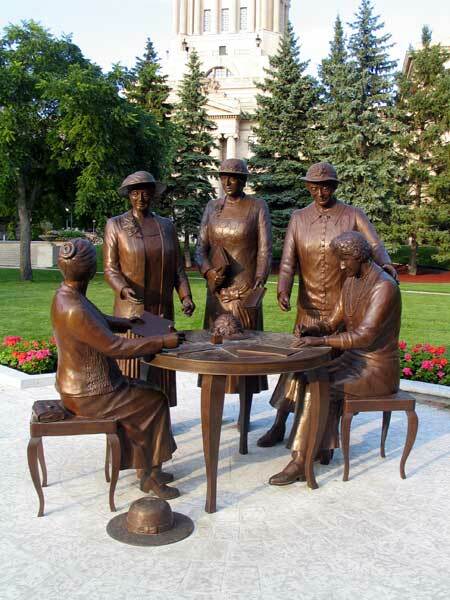 Created by local sculptor Helen Granger Young at an estimated cost of $750,000 on behalf of the Nellie McClung Foundation, the monument is one of three on the grounds of the Manitoba Legislative Building focusing on women, the others being monuments of Queen Victoria (on the north grounds) and Queen Elizabeth II (on the east grounds near Government House). A nearby plaque describes the role of Nellie McClung in the “Persons Case”.